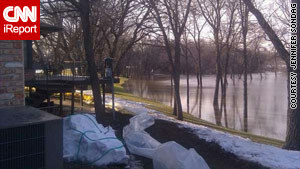 CNN iReporter Jennifer Sondag snapped these sandbags in a backyard Thursday in Moorhead, Minnesota. (CNN) -- The city of Fargo, North Dakota, largely completed flood preparations early Thursday as a surging Red River rose nearly 3 feet in 24 hours. The waterway was well beyond its banks along the North Dakota-Minnesota line. "Thanks to our volunteers, we've been able to fill a million sandbags and place 700,000 around our city," Fargo spokeswoman Karena Carlson said early Thursday. "We're just buttoning up a lot of our clay levees and putting a few more sandbags in place, and we hope to be protected up to 40 feet." Several hundred volunteers worked with the National Guard in Fargo to fill those sandbags as the river rose. Fargo set a record in 2009 when the Red River hit 40.8 feet. As of 9:15 a.m. Saturday, the river stood at 36.56 feet, more than 18 feet above the flood stage of 18 feet and past major flood stage. "Fortunately, we started filling sandbags March 1st. We thought our crest was going to be the first or second week in April. It turns out our crest is going to be this week," Carlson said. "So we did it in just over two weeks." Floodwaters are forecast to peak at 38 feet Sunday afternoon. Last week, warm weather and rain melted snow south of Fargo and Moorhead, Minnesota, causing the Red River to swell. Upstream, snow and ice have yet to melt, causing water to accumulate near the two cities. Across the river in Moorhead, Tom Holmgren spent Wednesday filling sandbags as Minnesota State University gave students time off to help with the effort. "Most of my friends have put in at least a couple hours," said Holmgren, who said sandbagging has become a source of college pride. "I know there's a big push in just the college community that's like, 'Yeah, we're doing it. We're saving this town.'" About 90 miles south of Fargo in Browns Valley, Minnesota, Kathryn Bartz said Thursday that she's grateful that a 40-year water diversion project is nearly complete. "Otherwise I believe we would have washed out a considerable amount of our town," said Bartz, a former town council member. Browns Valley suffered severe flooding from the winding Little Minnesota River in 2007, 1993 and 1943, and lesser floods many other years. Funding and property acquisition problems kept the diversion project -- consisting mainly of a canal to carry overflow around the town -- from being completed, Bartz said. A section of a new road that is part of the project washed out this week, but boulders and rocks were put in place to prevent further erosion, said Bartz, 66, who owns a hobby ranch outside of town. "That will be repaired when the water goes down," she said. "It's an inconvenience, but we are grateful that it has worked as well as it has." Meanwhile, in the Northeast, utility crews made steady progress restoring electricity after a nor'easter -- a powerful low-pressure system -- blasted the region over the weekend. About 40,000 customers in New York, New Jersey and Connecticut remained without power early Thursday, down from a peak of more than 500,000. "We recognize the hardship our customers face from being without power for days," said Jeff Butler, president of Connecticut Light & Power. "We appreciate everyone's patience as we continue to safely restore power as quickly as possible." The outages were caused mostly by power lines downed by Saturday's hurricane-force winds, which knocked over trees and utility poles. At least seven deaths were attributed to the storm, authorities said. CNN's Ed Payne and Jim Kavanagh and CNN Radio's Shelby Erdman contributed to this report.